I’m ashamed to admit that during the days of my youthful teenage ignorance one of America’s worst cases of police brutality somehow passed me by. It’s been a while since my last ‘Because I watched…‘ in large part because I was scared to tackle the German language barrier on Netflix but now I’m back on home soil I thought I’d give the recently updated Netflix a spin of the wheel. 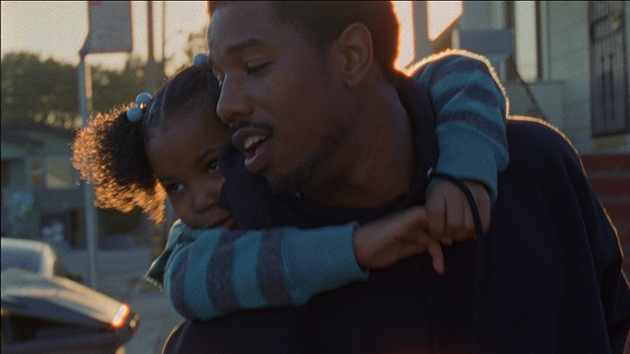 Without any context Fruitvale Station sounds a little lackluster but the story behind the title is utterly compelling. Ryan Coogler takes the helm in his first feature-length film and it’s an emotional powerhouse, featuring Michael B. Jordan in the starring role. Fuitvale Sation is a dramatic piece of fact-based storytelling that follows Oscar Grant during the events leading up to his death on New Year’s Day 2009 in Oakland, California at the Fruitvale BART Station. In a truly horrific story of police brutality Coogler does an exellent job developing the necessary characters and providing an honest insight to Oscar’s life. Oscar is a family man but he has a troubled past and he is trying to start afresh, to do the right thing and provide his daughter with a trouble-free childhood. Coogler frames Oscar’s life around the key theme of innocence, frequently employing plot devices to evidence Oscar’s unjust and untimely death. The film opens on a shaky camera phone to the sound of distress and the sights of police brutality that immediately stun the viewer into submission. Heading into the unknown I was unprepared for Coogler’s necessarily dramatic opening sequence that shapes your views for the remainder of the film. The amateur footage cuts with a gunshot and we’re lead into Oscar’s life before the fatal events of New Year’s Day 2009. There’s a long solemn build up, with sincere tones showing Oscar’s lighthearted and caring personality but also his short temper. Coogler had to tow a tough line in ensuring this wasn’t just a propaganda piece but an honest portrayal of Oscar’s life and personality. Oscar’s daughter, Tatiana, plays an important role in evoking sympathy in the viewer and is a prime example of Coogler’s employment of innoncence as a key theme throughout. Oscar has a touching moment with a dog after it becomes another statistic in America’s hit and run logbook, again another great example of innoncence but it’s in the final scenes where Oscar really comes into his own. Utilising his natural way with words it is made clear that Oscar was a guy anyone could get along with, friendly, kindhearted but most importantly self-less. By this stage Coogler has developed a knack for exemplifying Oscar’s innoncence and victim status. By chance Oscar runs into a man who was once in a similar situation, no job and no money. Oscar’s vulnerability shines through as he takes an honest interest in this man’s life taking inspiration and adivce and Jordan does a quality job of getting this emotion across to the viewer. The finale to Fruitvale Sation is disquieting as it builds up to the moment we first witnessed. The re-enactment is discomforting and dominated by a genuine encroachment of fear. A quick google search and you’ll see that Oscar’s death was met with both non-violent and violent protest resulting in rioting. But Coogler opts to avoid this, and rightly so. Instead, Oscar’s mother, played by Octavia Spencer, and Oscar’s friends are shown gathered in the hospital waiting room. Eventually receiving the heartwrenching news that Oscar didn’t make it through the surgery we’re left to contemplate as footage of the 2013 memorial held outside Fruitvale Station comes onto the screen. This is a great film that utilises powerful realism and somber tones to get it’s message across. It has it’s issues, the frequent use of the ‘word’ “breh” becomes a little irritating but contextually it’s sound. It delivers the troubled life of Oscar Grant as he shares his life with family and friends before an unexpected, unprovoked, unjust act of police brutality and while it’s on Netflix I thoroughly Recommend you check it out. I wasn’t expecting too much from this movie but was really into it. A quiet movie that didn’t get a whole lot of publicity but deserves to be seen. Glad to see your review.